"We looked like a deer in the headlights". 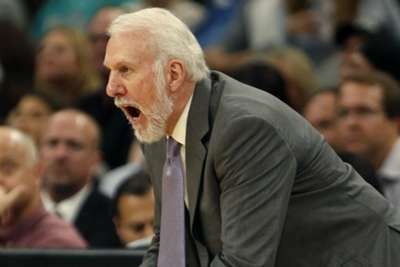 That is how San Antonio Spurs head coach Gregg Popovich described his team's loss to the Golden State Warriors in game one of the their first-round NBA playoff series. Reflecting on San Antonio's defeat, Popovich said: "We looked like deer in the headlights. "I thought we were prepared mentally and physically, but I was mistaken." The Warriors used an unorthodox starting line-up that included center JaVale McGee and Andre Iguodala at point guard, in addition to usual starters Kevin Durant, Klay Thompson and Draymond Green. With Iguodala and McGee — who had only 24 combined starts this season — on the floor, the Warriors shut down the Spurs' inside game. San Antonio scored just 22 points in the paint after averaging 43.8 for the campaign. The Spurs shot only 40 per cent from the field, and were outrebounded 51-30. Golden State held Spurs forward LaMarcus Aldridge (23.1 points per game this season) to only 14 points, with two rebounds. "It's not about them, it's about us," Aldridge said. "We've got to be better. I thought we didn't play as ourselves." The Warriors host the Spurs in game two on Monday.